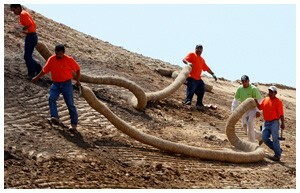 How do we differ from other companies that provide erosion control, site cleanup, and concrete washout services? We deliver the most comprehensive range of services in the industry, all managed under a single roof. You get the highest quality solutions to a broader range of needs at competitive prices with a single phone call. We don't rely on subcontractors or rented equipment. You get access to a large team of dedicated experts having all the necessary tools to complete your job, 24 hours a day, 7 days a week. When we make a promise about your job schedule, we keep it. Our people are SWPPP and SCAQMD certified yearly. We're experts at compliance, and regularly exceed their requirements to minimize delays, hassles, liability problems, and related expenses. Were Gold Members of the International Erosion Control Association, and we sponsor annual seminars led by top industry experts to provide clients with up-to-date information and training on regulatory agency compliance. All this means that you get a dependable partner who oversees all these details, gives you peace of mind, frees you up to do your highest value work, and ensures the lowest possible cost of compliance both now and in the future. Does this sound like the kind of team you want to work with? 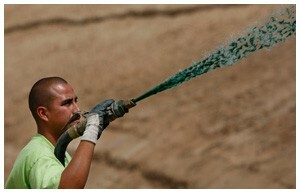 Then contact us today to experience for yourself the Inland Erosion Control difference!